Walking down the dock in Cairns on a sunny Australian morning we found the boat that would take us out to the Great Barrier Reef. Not time to board yet, we waited around on the dock. Two sorts of people began to gather near the ship. Those with just a beach bag, often dressed in swimsuits, and people more like us wearing street clothes and carrying luggage of some variety whether suitcase or backpack. Then some people who worked on the boat started getting things ready for people to get on. Watching them made me wonder what it would be like to work on a cruise ship. Those who would love to work on a cruise ship can find out about tourism programs via online accredited colleges. Once on board, crewmen stowed the luggage in a rack and sent the beach-bag people upstairs to the open seating on the top deck while the rest remained seated around the tables below. 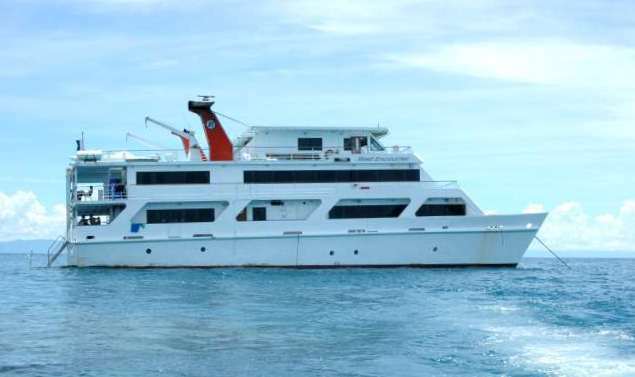 Turns out that the Compass boat did double duty, taking overnight guests and supplies out to the Reef Encounter, which rarely comes in to Port, while also taking day-trippers out to the reef. 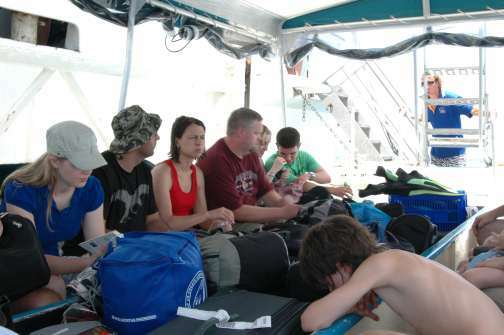 several days of snorkeling, or in my son’s case, diving on the reef. They explained some of what to expect, including the option of a beginner’s diving lesson for people who would like to give diving a try. Chris said most people have their first dive in a swimming pool, so the Great Barrier Reef certainly seems like a grand improvement on that for a first dive ever. Finally we met up with the Reef Encounter. 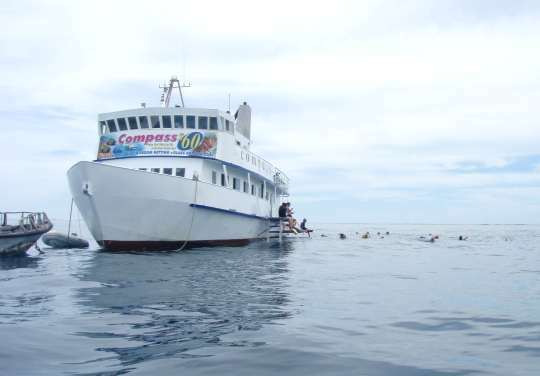 While part of the crew got the day trippers in the water for some snorkeling, others loaded all the luggage into a glass-bottomed boat. The luggage hid the glass bottom part so once all the people got in, it just became transportation to transfer us to the other boat. The people just arriving grouped up on some couches for information and instructions while those about to leave had lunch. We had our chance for lunch later, after they took note of any dietary needs or preferences anyone might have. After giving unobstructed rides to the day trippers, the glass-bottomed boat returned for the departing guests. Then we had a chance to dive or snorkel. They offered wet suit rentals for a nominal fee. John and I rented them, Sheri and Aaron did not. Chris had brought his own. The water there is warm, but besides adding buoyancy, the suits would give some protection against jellyfish, should we happen across any. We had seen stinger suits at shops in Cairns, but declined to purchase them. place until another day. They encouraged everyone to take the noodle floater things, but that was the only time I did so. I found it more in the way than helpful. Warm salt water is quite buoyant anyway, so it did not take a strong swimmer to stay afloat. underway for the next stop. 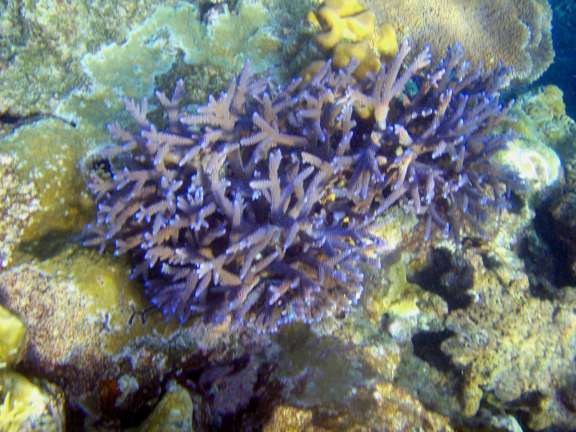 It moves around to different spots on the reef and has about 6 snorkel and dive sessions each day. One is a night dive, no snorkeling. Chris tried that for something different, but said he liked day dives better because he could see a lot more. One of the crew went out on the night dive in his birthday suit, apparently a tradition for their 100th dive as crew. Probably better done at night from all sides, all the better not to see or be seen. Breakfast came buffet style, other meals served plated. Besides the three daily homestyle meals, they also served a late evening dessert. Between snorkel stops and meals, there wasn’t a whole lot of time for other things, but they did have some board games and books for time fillers if needed. If someone had the money and didn’t want to come on the other boat, they have the option of helicopter transport. The boat had a landing pad on the top deck. Also a fancy cabin, and the “topdecker” couple who came in by helicopter stayed up there never to be seen by the rest of us, even at mealtime. The majority of people stayed just one night, but we stayed two. The other boat comes daily bringing people and supplies, so people can vary the length of their stay to suit their own needs. 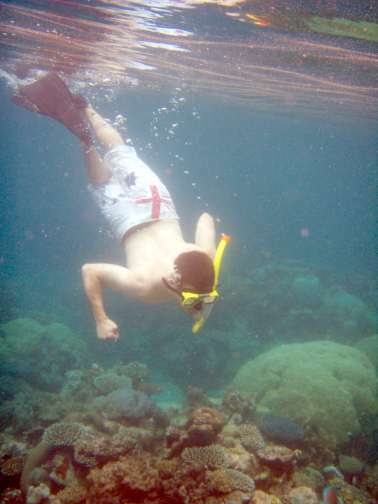 I love snorkeling, but staying forever was not an option. I recommend snorkel socks (available at dive shops) for anyone planning a voyage that includes multiple snorkel sessions to prevent the fins from rubbing sores onto tender feet. On the return trip to Cairns, the Compass boat makes a stop for one last chance to dive or snorkel, and also offers the opportunity for boom netting. This entry was posted in Australia, Great Barrier Reef and tagged Australia, Cairns, cruise, fun, Great Barrier Reef, nature, photo. Bookmark the permalink. Interesting account, beautiful picture of sea life. Aaron had a nifty little underwater camera. More underwater photos in the next two blogs. If we ever make a trip like that again I will get better pictures next time. I have a Sealife camera now and I get some good underwater pictures with it. Me too, I also have my trusty Lumix underwater camera now. I would love to take a trip like that again, the Great Barrier Reef is beautiful.